With the vision to be an unique, state-of-the-art, service provider, delivering global standards locally we aim at providing our partners with cost effective and result driven business solutions, while maintaining high levels of service standards. Our set of values are engineered towards achieving client goals in a successful manner while providing growth opportunities for our employees. 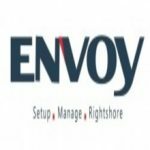 This ensures ENVOY HOLDINGS, continues to add value to businesses across the country and in the global market.